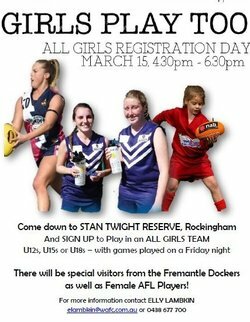 The girls will have an opportunity to hear about some of the Womens AFL players and their journey into football. There will also be representatives from each junior club with an all girls team - the girls can register there on the afternoon with their closest club! The junior girls competition is run on a friday night as a typical home and away structured comeptition. Teams will generally train once during the week.